29 November 2016, at 12:00a.m. The objective of this study was to determine if broilers have a preference for colour of feeders (based upon feed consumption) and if the colour of the feeders has an effect on performance. The results of the study were presented by J. Deines and colleagues at the University of Arkansas, USA, at the International Poultry Scientific Forum (IPSF) in Atlanta, USA, January 2016. The poultry industry has a multitude of colour options when selecting feeders for use in production. 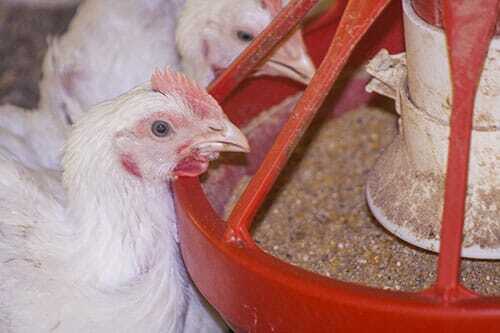 As such, the objective of this study was to determine if broilers have a preference for colour of feeders (based upon feed consumption) and if the colour of the feeders has an effect on performance. 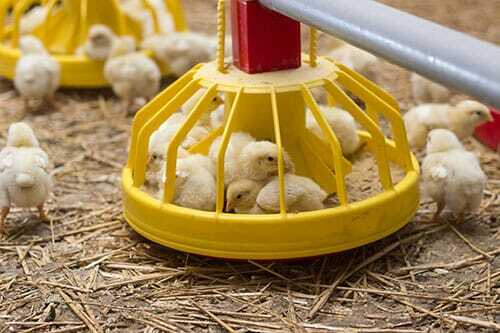 This experiment was conducted at the University of Arkansas Research Poultry Farm. In the first trial, 1,800 male Cobb 500 (female parent byproduct) chicks were randomly distributed throughout 24 pens in the same house. Feed and water were provided ad libitum and the following was provided for environment: 1 ft2 per bird, 25 birds per feeder, 50 birds per water line, modern LED lights, with all other specifications designed to meet industry standards. Two pen designs were created, with the first type (mixed colour, 12 total) measuring 10’x10’ and containing four feeders, one of each colour (red, green, blue, yellow), two water lines and 100 birds per pen. The second pen type (monochromatic) measured 10’x5’, contained two feeders of the same colour (three replicate pens for each colour; 12 total), one water line and 50 birds per pen. Bird weights (by pen) were recorded at placement and weekly through the end of the grow out period (six weeks). Feed consumption was measured per feeder on the following schedule: 0-72 hours, every four hours; three-seven days, every 12 hours; seven-fourteen days, daily; three-six weeks, weekly. Feeders in the mixed colour pen were rotated clockwise (by location in pen) after each weigh for the first three weeks, from weeks three-six they were rotated daily. Mortality and dead weight were also recorded. Significant differences were found in feed consumption (preference) between feeder colours in mixed colour pens for the total grow out as well as weekly consumption. Preference (by feed consumption) during the first five days, was a different colour than what was preferred weekly starting at week three and as a cumulative for the entire grow out. There was no significant difference in mortality, feed conversion, or bird weight. For the second trial, 1,800 female Cobb chicks were used. All other specifications were the same. The conclusions were also the same as in trial one. We can conclude that broilers have a preference of red coloured feeders (by consumption) when given the choice; however, this changes with age (green preferred to five days of age). We can also infer that the colour of feeder has no impact on the performance of broilers when no choice of feeder colour is given.